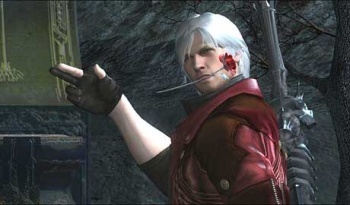 New Devil May Cry Set In "Parallel World"
Ninja Theory wants you to know that the original Dante is still safe and sound because the new Devil May Cry takes place in an alternate reality. Capcom's upcoming Devil May Cry reboot may have upset a number of fans (because it was designed to), but now it looks like Ninja Theory is ready to stop stirring the gamer hornets' nest. The developer has revealed that the game isn't so much a reboot as it is a re-imagining: The new Devil May Cry is taking place in an "parallel world." According to Siliconera, Japanese publication Dengeki PlayStation has revealed that "The Dante we know and love still exists in our world and the Marvel vs. Capcom 3 universe. Ninja Theory suggested this storyline shift, according to the magazine." Details about what exactly caused this alternate reality haven't been fleshed out yet. Honestly, Ninja Theory waving everything away with the "parallel world" excuse isn't the laziest piece of storytelling out there (that award still goes to the "it was all a dream" explanation), but it's still a little disappointing to hear about. However, now that we're in Alternate Reality Territory, we'd better get to see a bunch of evil versions of characters, sporting goatees. Because that's how parallel worlds work.